Endometriosis…you’ve either heard of it or you haven’t. I had never heard of it until I got diagnosed with it that it. Now I have mentioned about endometriosis before in my post on “being a chronically ill parent“… But this post is dedicated to endo, with coping strategies, tips and tricks. My story with endometriosis (or endo as I prefer to call it) I guess started at 8 when I started my periods (young, eh?). I remember being so confused at that age, and I remember one thing that really upset me was not being able to do my swimming lessons at school (there was no way at 8 years of age I was using a tampon). As I grew older my periods became more and more painful and my mum would say; “welcome to womanhood my baby, it’s normal for it to hurt,” and one day I came on and was in so much pain that I couldn’t move from the sofa. I was crying in pain… my Nan insisted I saw a doctor who didn’t say much but prescribed mefenamic acid for the cramps. I was offered the pill to regulate my periods but my mum said no as she didn’t feel going on the pill at 13 was right for me, despite the fact that I was bleeding for 3 weeks of the month and had no pattern at all. Mefenemic acid helped to ease the cramps for a year or two. “We’ll need to do a laparoscopy to confirm but I think that’s what we’re looking at”… They didn’t really tell me much about the condition they just told me that I would be having surgery. Naturally, I went away and researched it myself. Endometriosis UK were fantastic at informing me, and it finally all made sense. The reason that my ultrasounds were coming back as clear is because endometriosis doesn’t show on scans; only through surgery can you be diagnosed with endo. I opened my eyes to see him stood there, I tried to sit up but felt like I had been stabbed in the stomach. Zoladex was a weird one. I had a love/hate relationship with it. Zoladex is an injection that triggers a chemical menopause, so all the time i was going through chemical menopause I wasn’t menstruating therefore no periods = no flare ups (in theory)… BUT with this came all the menopause side effects; hot flushes, weight gain, acne etc., plus it was a tad embarrassing to be going through menopause at 16, I guess, but it helped… Massively. But, like all good things, it came to an end. The maximum amount of time that you can stay on Zoladex is 6 months, but I’ve had 3 rounds of 6 months sessions in total now. My periods are still extremely heavy and painful and my flare ups are now so painful I have to rely on oramorph and tramadol as well as seeing the chronic pain team for tender point injections. Though, when I have my monthlies I subscribed to a company called Pink Parcel who make my periods less stressful and I look forward to my period just for my box of goodies! My battle with endo is ongoing, I was later diagnosed with PCOS which i’ll save for another post. I urge anyone with endo like symptoms to see their GP. Heavy and painful periods are NOT normal and you don’t have to suffer. On the 7th of July Sarah and I from mummykind will be doing a live Q&A session on Facebook, so if you have any questions on endo feel free to inbox us them or even comment them. I’ve made it my personal mission to raise awareness on Endometriosis, I’ve previously had a letter from David Cameron himself regarding the matter, I won’t rest until young girls are educated properly on women’s health! I've not met a single person who has been able to talk to their doctor about their menstrual pain without receiving some kind of condescension in response! Women's health needs to be taken seriously. Thanks for commenting. This sounds awful, hopefully you writing this will help others too. Thank you for joining the #KCACOLS linky. Hope you come back again next time. Thanks Ali! 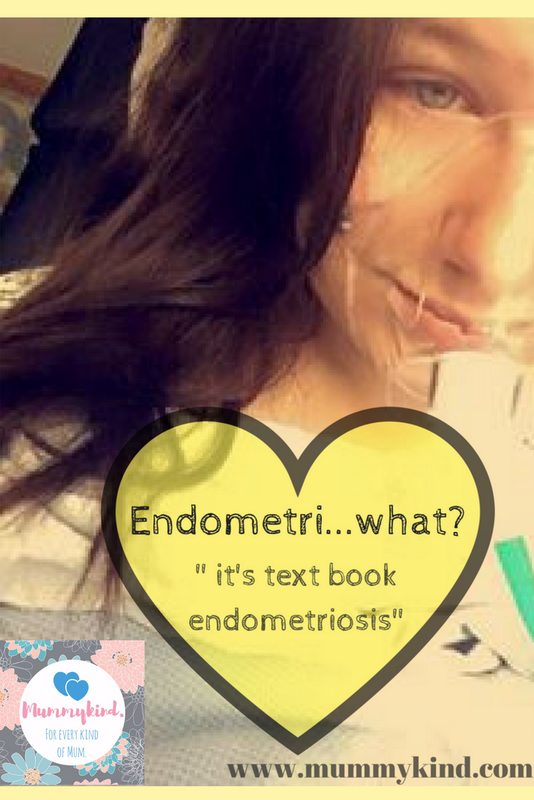 I'd never heard of endo until I met Amy so she's doing a great job of raising awareness!